We are going to make a hand motion following robotic arm. This robotic arm simply follows the motion of our and and move accordingly. Such robotic arm can be widely used in industries where it requires human intelligence as well as machines help we make the work done by our hand at one place and other hundreds of robotic arm simply follows the work done by our hand so we can save time and effort and we can do job in large scale in just effort of one. So before we are going to make this we need to buy a robotic arm kit or you can make it own by 3D printer. First we need to assemble the parts of robotic arm and fit the servo motor to it. follow the instruction in robotic arm kit for assembling the robotic arm.As in pic above the assemble the Robotic arm. Our connection and wiring is ready. 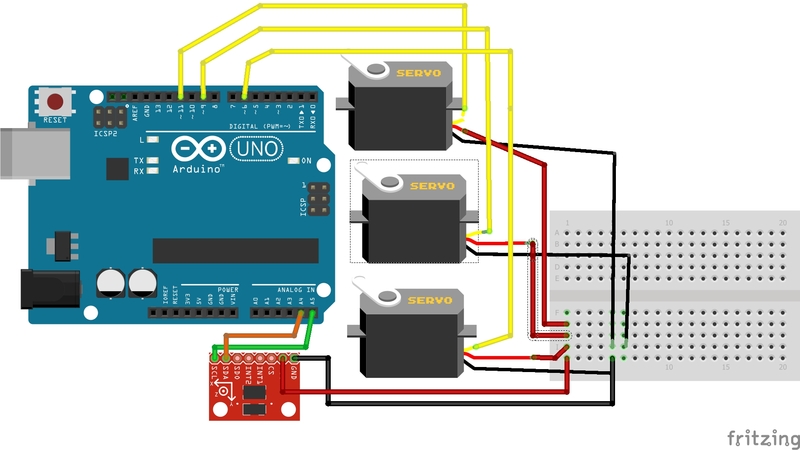 Now install add the mpu6050 library to Arduino IDE if already it is added then its ok.
Now downlode the code with and upload it to Arduino and you are ready. You can also design it according to your use .such a Robotic arm can be used in production in industries where human inelegance is also needed. From EFY group. (Electronics for you). Ashwini kumar sinha a Robotic lover and electronics hobbyist.